Home to Roost Lays a Golden Egg – A California Chicken Consulting Business! Sometimes the oddest things happen at the oddest times. On Sept. 21, 2010, at around 10 AM, my phone rang. That in and of itself was not odd, but the person on the other end was a woman from California, wanting advice on starting a chicken consulting business. Yes, that’s odd. But it gets odder. Sept. 21, 2010, was the day of my WCIU appearance, which featured female entrepreneurs doing battle against a tough economy by following their passions. The woman on the phone introduced herself as Cherie. She had found my phone number on AOL’s Wallet Pop article and wanted to talk to me about my urban chicken business. When I told her that I had been sitting in a TV studio that morning, doing a live show on chickens, female entrepreneurs, and following our passions, we both had a long hearty laugh at the coincidence. 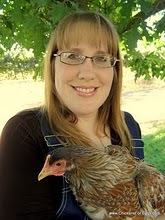 My husband didn’t know anything about chickens until he met me – then he tried to convince me that I should make a business of it. I thought he was crazy of course, but after being laid off and having days turn into months with few substantial job offers, I needed to start exploring other options. “Do what you know!” he told me, and when the article about you and “Urban Chicken Consulting” popped on my computer screen, I finally accepted that he might be right! Your story inspired me to go for it, so here I am! Cherie and I talked about some of the services I offer the Chicagoland area: workshops, classes, consultations, presentations, etc. and some of the lessons learned from my experience. It was a great conversation, and I am proud to have helped hatch another business in a tough economy! We’re scheduled to appear on WCIU between 7:30 and 8:30 AM on Sept. 21. Tune in to hear more about urban chickens! A event at LaSalle Street Church downtown a few weeks ago landed an interview at Lavazza over gelato for the chicken purse and me!